Chinese media outlets have been keeping an eye on Australia recently, and news coverage about the nation is time-sensitive. For example, Chinese media outlets, including the Global Times, reported and editorialized on Australia's 2017 Foreign Policy White Paper shortly after its release. In addition, coverage related to Australia is wide-ranging, touching on all aspects of Australia, as well as plenty of in-depth reporting. For one thing, Chinese media outlets are bound to beat a path to report on the Australian Open in January 2018. Furthermore, Chinese media outlets, especially mainstream ones, seldom criticize or make irresponsible remarks about the domestic affairs of Australia. Similarly, Australian media outlets also pay close attention to China. Australian mainstream media's coverage of China reflects that Australia attaches importance to China, and in turn, China is vital to Australia. However, some Australian media outlets made inaccurate, unjust and even malicious reports on China, such as "Australian universities are helping China's military surpass the United States," "Australia is losing the battle against China's 'citizen spies,'" and "Australian sovereignty under threat from influence of China's Communist Party," all of which are sensational headlines, not to mention the content of these articles. Huang Xiangmo is another example. As a key Chinese businessman in Australia, Huang was accused of being a spy and agent by Australian media outlets, triggering great concern among Chinese readers. To sum up, the reports mentioned above are in fact the Australian version of the "China threat" theory, which has been hyped up from time to time in the past decades. Chinese media outlets, however, refer to it as the "China infiltration" theory. One of the reasons for such illusions is that Australian media outlets have no understanding of China's peaceful development, but instead conceive doubts or even fears. Yet media outlets in the two countries can play an instrumental role in addressing these problems. Australian media outlets need to actively inform, instruct and entertain their audience with an accurate and well-rounded image of China. At the same time, there should be more exchanges between both countries' media outlets. As the saying goes, seeing is believing, so we warmly welcome Australian media outlets to China. In particular, under the sister-state relationship between the state of Victoria and East China's Jiangsu Province and Southwest China's Sichuan Province, media outlets of the former should frequently visit the latter two. Dispelling misunderstandings and clearing up confusion about China will require the Australian media to learn more about China's foreign policy. At only 1,441 Chinese characters, "Following a Path of Peaceful Development and Working to Build a Community with a Shared Future for Mankind," Chapter XII of the report to the 19th CPC National Congress, delivered by General Secretary of the Central Committee of the Communist Party of China (CPC) Xi Jinping, elaborated China's foreign policy, while Australia's 2017 Foreign Policy White Paper has dozens of pages. To understand China's foreign policy is instrumental in having a more accurate knowledge of China's path of peaceful development. Australian media outlets should convey to its audience this message: China's peaceful development can only benefit the countries in the Asia-Pacific region, even in the wider world, rather than posing a threat to them. Australian media outlets should work hard to avoid reports of making groundless accusations to demonize China. Such coverage can only undermine bilateral ties and impair the relationship between Chinese in Australia and Australians, thus triggering Chinese people's antipathy. After years of development, China has become a pluralistic society. Ordinary people have great autonomy to travel or study abroad. They will only choose a friendly, safe country which makes them psychologically comfortable rather than a place where they would be suspicious of being a "citizen spy" by local media. China has indeed imported large quantities of iron ore, beef and coal from abroad, but Australia is not the only country in the world that produces these products. What South Korea experienced in the past year is a good example of how the Chinese public could make an impact on another country's economy and trade. 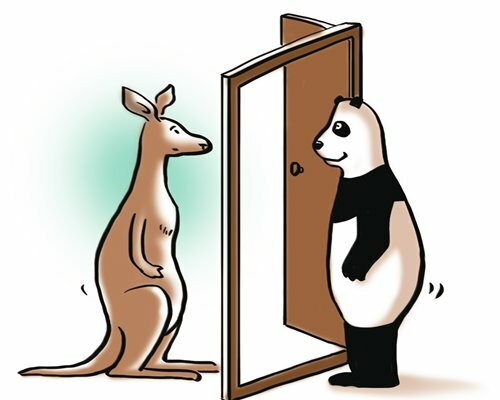 After celebrating 45 years of Australia-China relations, more consensus is expected to be reached when we celebrate the 50th and 55th anniversaries of China-Australia diplomatic relations.